Right away we can tell this story is quite unusual—and I’m not talking about the rifle chasing a man under it’s own power. It’s written in the rarely used second-person mode, referring to the protagonist as “you”. I’m intrigued. Our “hero” Jim Fulson supervises the supplies of hunter John Ellis who is on safari in Africa. Ellis is an expert marksman, but the locals believe his skill is due to his magic gun. Fulson is a big coward who wishes he had the courage to pull a trigger, but when he hears about the magic gun, he shoots and kills Ellis so it can be his. This seems completely out of character for the spineless Fulson, but whatever. Anything to advance the plot. 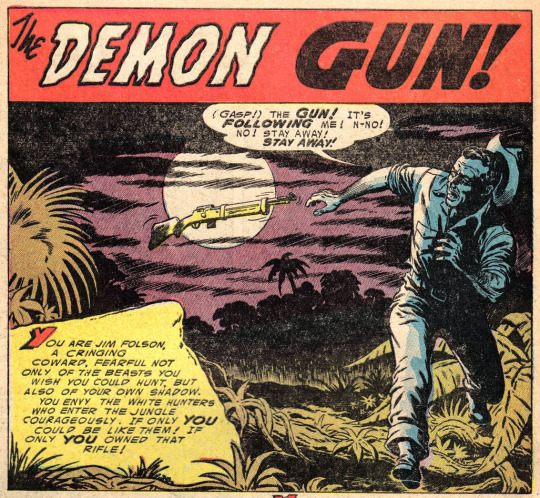 With the magic gun, Fulson becomes an amazing shot just like his dead boss. When the gun seems to turn on him, he tries to get rid of it, but it chases him, flying through the air, and shoots him dead. They try to explain this by the fact he was carrying a magnet in his belt. Wait, what??? That’s not how magnets work. I have no complaints about Jim Mooney’s art, but no wonder the writer is unknown. No one wanted to take the blame for this script! 2. The Phantom of the Sea! A young man named James Welling and his wheelchair-bound Uncle Ted are visiting a small fishing village on the coast of Maine. 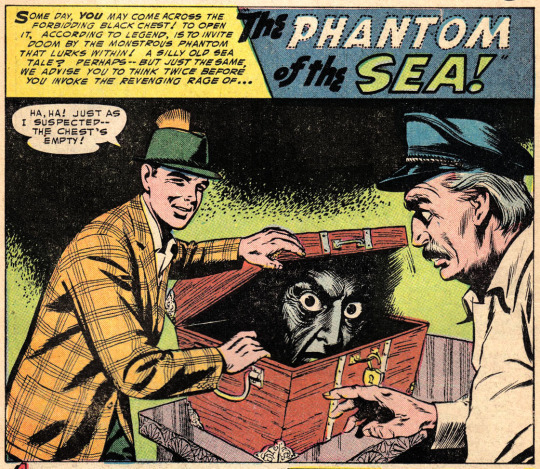 Checking into an inn, they discover an old sea chest that legend says brings death by the “Phantom of The Sea” to anyone who opens it. The two are skeptical, but they leave the trunk alone. Early the next morning the innkeeper spies Jim peeking inside the chest, but the young man runs away when he is approached. Later, James and his uncle are fishing alone in a small boat at sea when Uncle Ted (who, it turns out, can actually stand and walk) pulls a gun on his nephew. Before he can pull the trigger, The Phantom of the Sea appears in a giant wave and sweeps evil Uncle Ted overboard. Back at the inn, we learn it wasn’t James who opened the trunk that morning but Uncle Ted in disguise. He hoped to kill James and blame his death on the chest’s curse, as James is a millionaire and Uncle Ted was his only heir. Since it was Ted who opened the trunk and then died at sea, the curse must be real! The narrative moved at a brisk pace, finished up with some nice twists, and the curse wasn’t explained away at the end. Add in the scary drawings of the phantom and we have a fairly successful story! It’s not Shakespeare, but it was better than the previous one. 3. I Was Born To Kill! When George Albert delves into his family history, he discovers he is from a long line of murderers! He jumps to the conclusion that he is destined to kill, but decides he can reverse the curse by donating blood. Logic doesn’t seem to be his strong suit. “Yours is a rare blood type we cannot use”, said no doctor ever. Another doctor however does take Albert’s blood, but the first two patients who receive his donation commit murder! He tries to warn a third patient but then things get really weird. Albert finds out the man who took his blood wasn’t a real physician and he used drugs to cause madness in the patients who received it. He wanted revenge on them because they had been members of a college fraternity that had blackballed him. 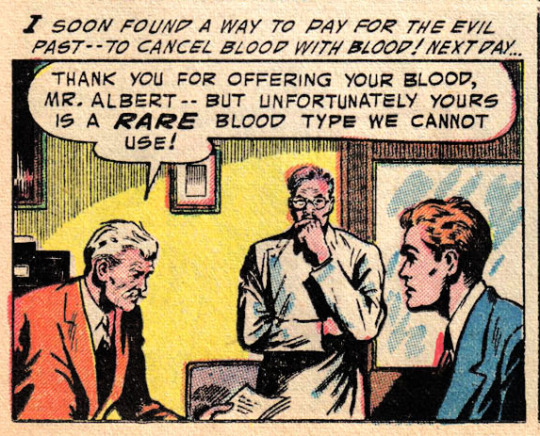 He thought he could blame the whole thing on Albert’s cursed blood. Albert still thinks his blood is tainted and he’ll murder someone so he’s put away in an insane asylum along with the quack who cooked up the crazy scheme. Hopefully, whoever wrote this script is in there with them. 4. The Statue That Was Tried For Murder! 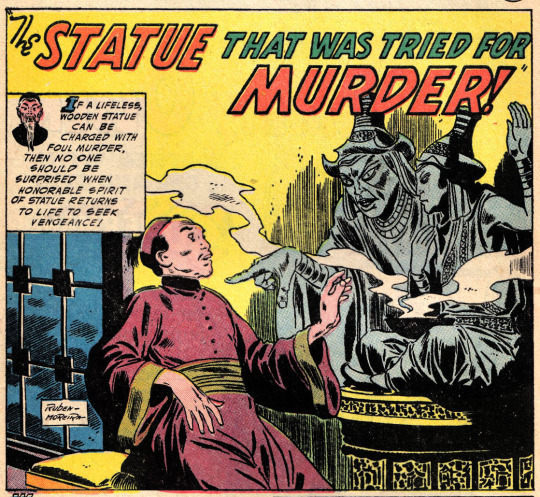 If you believe what you read in comic books, statues could be tried for murder in seventeenth century Peking, China—which happens to be where this story takes place. A man named Mukden has traveled to Peking seeking to kill the husband of a woman he had hoped to marry. Upon hearing about the statue statute, he obtains a small statue and bashes his rival over the head with it and leaves the statue at the scene of the crime. 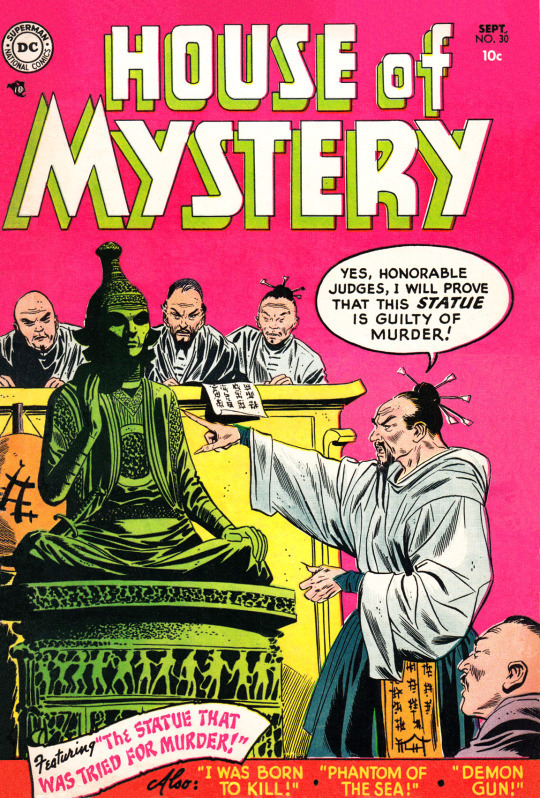 The statue is tried and convicted of the murder and Mukden is off the hook. Or is he? He starts seeing different versions of his murder weapon wherever he goes—the statue seems to be pursuing him. Eventually, he cracks up and turns himself into the police. There it is revealed that Mukden, being new in town, didn’t realize Peking had a new ruler who had cast and set up thousands of statues of himself all over the city. Mukden had unwittingly used one of these as his murder weapon—which explained why he saw the statue everywhere. This is completely farfetched but since it happened a long time ago in a country far away, it must be true! At least that’s what the nameless writer who dreamed all this up hoped the reader would believe. Maybe next month we’ll get some stories someone’s willing to put their name on.